Few people have visited the world's 7th Continent and even less can say that they've camped on it. Forego the comforts of your cabin for a once-in-a-lifetime night on the ice, surrounded by Antarctica’s pristine wilderness and the odd inquisitive penguin! Everyone can participate in this fun activity - regardless of age or fitness levels - and no prior experience is required. All you need an adventurous attitude and a couple of extra layers of clothing. 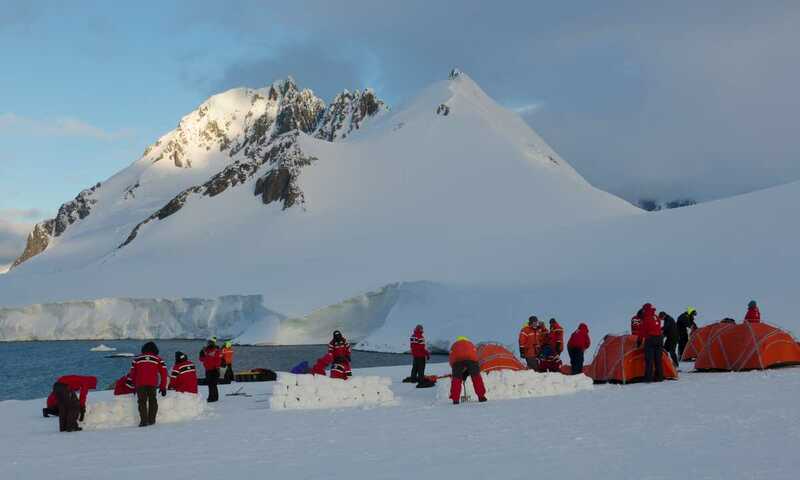 Overnight camping is commonly available on the majority of Antarctic Peninsula departures and for the experience is a well-priced optional add-on. As the group size is typically limited (up to approx. 30 people), it’s important to secure your camping places at the point of booking your cabin. Being on the continent on a still summer solstice night was something so special. The majesty of the landscape and some curious penguins and seals as neighbours - completely magical. 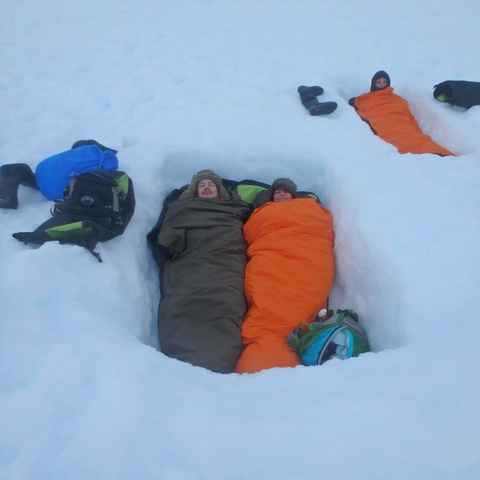 We had 4 penguins waddle right past our sleeping bags; an absolutely amazing experience! It’s pretty straightforward. On trips which offer camping, one night of the voyage will be selected by the Expeditionary Leader to sleep ashore.That afternoon, the ‘camp’ will be prepared and tents pitched, which are typically 2-3 man tents. In favourable weather, campers may be offered the chance to sleep out in a bivouac (bivvy) bag under the open sky, which is an experience not to be missed. After dinner on the ship the camping party, accompanied by at least one member of the expedition team, will be taken ashore by zodiac to spend the night. The ship will remain close by, but out of sight. Cooking stoves and food are not allowed on shore in accordance with Antarctic regulations - only emergency rations, survival gear and drinking water are allowed. The following morning you’ll be picked up early in time to return to the ship for breakfast, so you'll spend a maximum of 10 hours out on the ice. The Antarctic Peninsula has a small number of places favourable to camping, but certainly nothing that could be construed as a ‘campsite’ and just to be clear - there are no facilities. Typically camping is charged as an optional extra. The cost varies from one ship to another, but budget for between $150 - $300 per person. However, it's worth being aware that it’s included in the voyage price on a small number of ships and select departures. The good news is that the vast majority of voyages to Antarctica offer camping as an optional add-on. However, as the number of spaces is typically limited the best thing to do is to ask us to check availability and secure your places at the point of booking your trip. For the sheer experience and brag factor, the return on your fairly modest investment to camp in Antarctica is hundredfold and well worth it. Plus, the good news is that it’s rarely as cold as anyone thinks. My favourite camping story comes from the Swoop Customers who camped on New Year’s Eve and saw in the new year while being serenaded by a humpback whale’s exhalations in the bay below them. 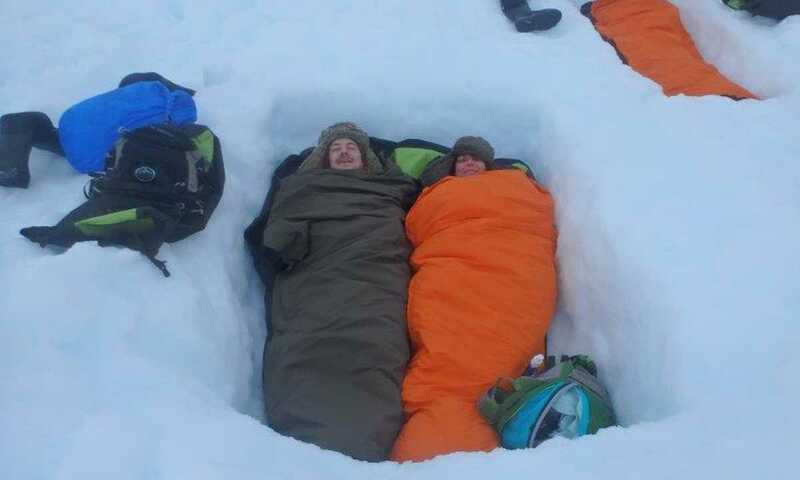 ​ How cold will it be in the tent? In the summer months (December-February), temperatures on the Antarctic Peninsula are generally warmer than expected, typically averaging close to freezing or even slightly warmer, which means camping isn’t the ordeal that many expect. In fact, for those who live in the northern hemisphere it can actually be colder at home at that time! Do I need to bring any extra kit? You will be provided with all of the camping equipment you’ll need, so all you need to bring are a couple of extra layers of clothing. Are there any toilet facilities available? For those ‘caught short’ while out on the ice, emergency facilities are provided in the form of a portable ‘camping toilet’ which is discreetly positioned away from the tents and is screened behind a makeshift snow wall. The accompanying expedition team member will be in direct radio contact with the ship and a zodiac can quickly be dispatched from the ship.